An email containing five questions was sent to all 13 candidates in the 2015 ICCSD election on August 19. We informed all candidates that the deadline for inclusion in this publication was August 28. The answers that we received are unedited other than to add the candidate’s photo and to format the answers to each question for our readers’ comparison. Thank you to the candidates who responded. 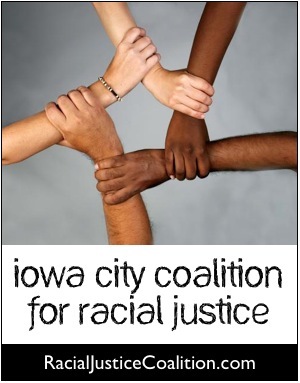 Petitioning Iowa City City Council to end discrimination against black youth in Iowa City and its public spaces. Click here to view footage from public comment at the July 27, 2015 City Council Meeting (0:05:00 – 1:30:00). Click here or on the cover image for the full PDF version of the Racial Equity Report. Although the Equity Report is based on local issues, it can serve as a guidebook for leaders in other communities working toward promoting racial equity and fairness. The challenges we face are common in communities across the nation. Feel free to contact us if you’d like to learn more about how you can take action in your local community. The video below is a compilation from a public gathering in Iowa City about racial justice and equality.